Matt & Yvette Barker were looking for a business that would allow them more freedom to spend time with their young children. A business where they could determine their own hours and location of their operation. This is something they could not do by working for someone else. While attending a trade show, Matt discovered cinnamon glazed almonds. After much research and discussions with Yvette, Barker's Olde Fashioned Almonds was born. Initially, their family members thought they were crazy to get into the nut business, but they soon proved everyone wrong. Many hours were spent perfecting the glaze and roasting process and after several successful years the Barker's decided to add more nuts to their menu and changed the name of the business to Totally Nutz®. After having received so many inquiries from interested parties, Matt & Yvette began franchising in 2014 and Totally Nutz Franchise was born. “What we loved about the idea of franchising is that we can teach our concept, trade secrets, and best practices with new business owners and watch them achieve success. Our business changes lives. It allows people to leave unrewarding jobs, long commutes and spend more time doing what they love,” said Yvette. “They are spending more time with their families and many of them are running Totally Nutz as a family business. The Totally Nutz concept teaches great life skills and creates jobs for so many people. It is exciting to see our Totally Nutz brand growing as we develop relationships with venues and events across the country. We believe our franchisees are part of our Totally Nutz family and do everything we can to support them and help them be successful,” added Matt. The family is a big part of the Barker’s lives. Having the flexibility to attend their children’s soccer games, travel with them on school breaks, and to enjoy quality family time together is one of their biggest priorities. 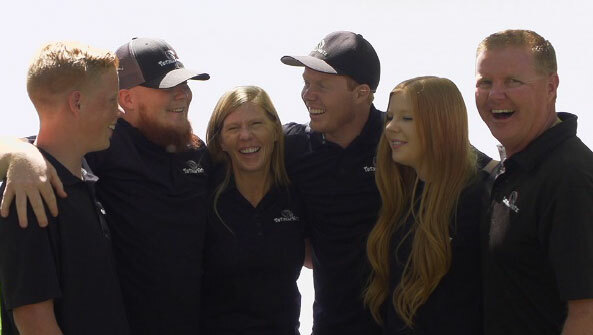 In addition to running the franchise side of Totally Nutz, Utah is the one state that the Barker’s retained for their family while every other state is open. During November and December of every year, they have Totally Nutz locations set up in five Utah malls. Their entire family works very hard during this time period, staffing all locations, delivering the product every week, creating holiday gift boxes for selling in the malls, and for their corporate and individual clients. At the end of the holiday season, the Barker’s take a long vacation to relax and spend time together. “Being able to work hard and play hard is why we have enjoyed this business concept. Determining our own schedule around our family calendar is so important to us. You can’t say that about very many jobs,” said Yvette. It has been 28 years since the business was started and they are still crazy about the business. To date, Totally Nutz Franchise now has over 65 franchises located throughout the United States.